Day 1 of Orientation started with a tour of campus. I was reminded of the scene in Arrested Development where the Bluth Company employees blindly follow someone around until they end up on Catalina Island. It was kind of like that. We blindly followed other people in our uniform navy blue EPIK shirts, who were presumably following our Korean orientation staff. Nobody paid attention to where we were walking or what was being said. After that, it was a lot of sitting in big lecture halls. 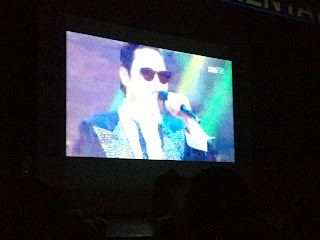 We were treated to a traditional Korean music concert... and a giant screen projection of Gangnam Style. I did, however, learn the proper way to perform a Korean handshake (minimal eye contact, left hand supporting right wrist), and that Koreans are very open about pooping. We had about a 15 minute portion of one of the lectures today that discussed how Koreans will be late for things because they're pooping, and if you ask why they're late, that's what they'll tell you. We were shown this video clip.. projected on a giant lecture hall screen. Hilarity ensued. One thing that's proving to be challenging is the food. Having had genuine Korean food, I know it is delicious. But the stuff we're being serve here.... not so much. 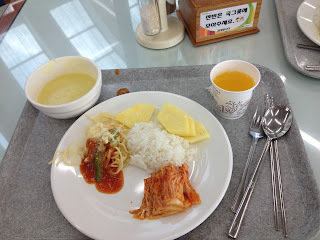 It's all some weird version of what Koreans think Americans eat, plus rice and kimchi. For dinner, I forced down part of a cold drumstick, some carrots, rice, a bit of pork curry soup, and, of course, kimchi. Koreans eat kimchi with every meal. Luckily, I know I'm not the only one who is struggling with the food here. It seems to be a pretty common problem. This was lunch, which wasn't so bad. "Spaghetti" with asparagus soup, rice, and of course, kimchi. We've decided that they're trying to feed us some weird hybrid of Korean food and what Koreans think American food is like, all mass produced for 400ish brand new English teachers. The result is a lot of room-temperature meat and rubbery vegetables.